Growing tomatoes upside down: does it work? Does Growing Tomatoes Upside Down Produce a Good Crop? Growing tomatoes upside down – does it work? 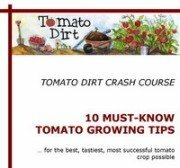 Tomato Dirt received this letter from a reader. We decided to look at the ups and downs of growing upside down planters, so you can decide for yourself. What do you think about those bags that grow the tomato plants upside down? “They” (the companies that sell them) say you can get up to 100 tomatoes with one bag. I tried one last year and I had about 3 tomatoes total. Does anyone have any success with them? Upside down tomato planters are a form of container gardening. The tomato is planted through the bottom hole of the planter, bag, or basket. It grows suspended downwards. The planter or bag hangs from a hook just like any other hanging container. Some upside down tomato growing systems use bags as the growing container; others use common plastic planters. You can buy ready-made upside down planters, sold commercially as the Topsy Turvy® Planter, the Upsy Downsy™ Tomato Planter, and the Upside Down Tomato Garden (sold by Hammacher Schlemmer). You can also make your own simple upside down tomato planter by drilling a hole in a bucket, filling it with potting soil, planting a tomato plant through the bottom, and hanging the planter. The brains behind upside down tomato planters claim these containers use gravity as a vertical growing advantage. Water is poured into the top of the bag or planter. Gravity pulls the water and nutrients directly to the roots. Proponents also argue that bag-style versions heat the tomato plant as a greenhouse does, allowing the root system to expand. Advocates cite these advantages to growing tomatoes upside down. Upside down planters save space. People who live in small homes or apartments, as well as those with plenty of yard space, can grow tomatoes in upside down planters, which can be hung in balconies, on porches, and in car ports. Upside down planters reduce soil-borne problems. Hanging plants have less to no contact with the soil, which means slugs, other soil-borne pests and soil-borne diseases have less opportunity to act. Upside down planters are less work to set up. Planting and maintaining a hanging planter is a lot easier than cultivating and looking after a garden plot – even when you must post brackets or hooks from which to hang them. Upside down planters have fewer weeds. Weeds don’t take root in an upside down tomato planter because there is hardly any exposed soil. Upside down planters allow for better circulation. Since the tomato plant is suspended, air can move freely around branches, helping prevent fungi and allowing more opportunity for pollination. Upside down planters are movable. You can place a planter where it will get direct sunlight. If the forecast is for cold temperatures, you can move the planter inside overnight. If summer days are too long and too hot, you can move it into the shade for awhile. Upside down planters eliminate gardening messiness. There’s no need to get on your knees to work the soil. Upside down planters are versatile. Herbs, flowers, and other kinds of vegetables can be grown in an upside down container. Advocates and opponents alike point to these problems to growing tomatoes upside down. Watering. Container tomatoes dry out easily and require frequent (often daily) watering. Some upside down tomato planters have a water retention sponge in the middle of the unit or a reservoir at the top to allay that problem. Nevertheless, gardeners struggle for the right moisture balance in upside down planters, often over-watering (leading to tomato rot, disease, and nutrient deficiencies) or under-watering (leading to stunted growth). Water-borne diseases. Gardeners say this, along with keeping plants watered, is the biggest drawback to growing tomatoes upside down. Moisture pours through the bottom of the container, landing on leaves, stems, and fruit, which spreads of diseases like wilt, blight, and other fungi. Time. While upside down tomato planters are supposed to save time, caring for them requires constant vigilance. Low production. Makers claim an outstanding yield, but gardeners regularly report low fruit production for the effort invested. Messiness. Water drips through upside down planters, leaving a mess beneath. Limits. Planters only hold one plant – maximum two, if you plant one hanging and one upright in the top of the container. An upside down tomato garden, which is larger and more complex than a simple planter, can accommodate a few more. Space. Planters require set up. They need a hook or bracket from which to hang and space in direct sunlight. Plant size. Fruit can weigh the plant down, especially if you select a variety with large tomatoes or a variety that normally grows quite tall. Plant shape. Tomato plants reportedly turn upward towards the sun in a U-shape to grow, creating balance problems. Exposure. Upside down planters can move around a lot in the wind. Excess sunlight dries out soil too fast. If hung off a swing set cross bar or a post, plants and bags are susceptible to squirrels and other wildlife. Read the product label to know what you’re getting. Some commercial products include potting soil and seeds. Others do not. Plant small seedlings (about 6 inches high) rather than larger ones to avoid excessive root damage during planting. Plant a determinate or bush variety so plant does not weigh down planter. Choose a planter with a water reservoir or sponge to prevent soil from drying out and roots from baking. Add water retention material such as vermiculite to potting mix that so that soil retains water rather than just flushing straight through.